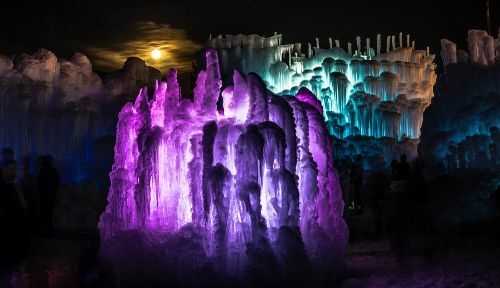 The Midway Ice Castles are back this year and they are even bigger and better with fun new features. We had the opportunity to visit on Tuesday and I just had to tell you about the fun time we had. We had a wonderful time at the Ice Castles! This year they have added two new ice slides and my kids LOVED them. I think they would have spent the entire time on it if we let them. They also had an ice couch that my kids thought was awesome. Make sure you are wearing water-proof clothes (snow pants and such) if you want to do the slide or some of the small tunnels, or you will get nice and wet. There are lots of fun tunnels that we loved to explore. 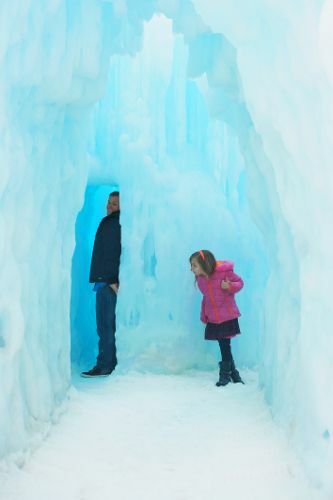 The ice castles are fun for all ages. The kids loved exploring and I loved admiring the beauty of the ice. I love that you can visit the castles during the day or at night and have a completely unique experience. We visited during the day which I thought worked really well with little kids. They enjoyed it more since they didn’t get as cold as fast and they could see really well. You can really see the detail of how amazing the castles are. But going when it is all alight at night is pretty spectacular too. If you want to see both it might be worth getting tickets for right as the sun is going down. If you are planning on going I would recommend getting tickets online. They sell out fast for the weekend and are even cheaper online. You do have to buy tickets for a specific date and time online. Have a great time and don’t forget to dress extra warm!